“Governance is at the heart of how change happens,” says Makda Getachew, MPP 2010. Despite progress in recent years amid political stability and a government committed to poverty reduction, Ethiopia is still one of the world’s poorest countries. Around 25 million people – a quarter of the population – live in poverty. Women are particularly disadvantaged, facing limited access to education and the work force, high rates of mortality in childbirth, child marriage and low political representation. Ethiopia is Makda Getachew’s home country. Her studies took her to Germany, where she acquired a bachelor’s in integrated social sciences at Jacobs University in Bremen and a Master of Public Policy at the Hertie School of Governance in 2010. The two-year MPP included a semester of African studies at Syracuse University in the US, through one of the many study abroad opportunities the Hertie School offers. Today Makda is a Social Development Adviser at the UK’s Department for International Development (DFID) in Addis Ababa. Her role entails technical advice and leadership on programmes relating to economic and social development, such as gender equality, poverty reduction and social justice. The DFID has made empowering and protecting women and girls a cornerstone of its strategy in Ethiopia. Child marriage is one of many gender-equality problems Makda is tackling in her role. The median age of marriage among Ethiopian women aged 20-49 is 16.5 years. It is one of the major causes of death in childbirth, puts a premature end to girls’ education and prevents them from entering the workforce. In the year since she began working at DFID Ethiopia, she has been involved in a programme in the Amhara region, where girls marry on average at 14.7 years. In this role, Makda has had the opportunity to put some of her Hertie skills to work, interfacing with many actors on the ground. The programme works with community groups – priests, sheikhs, parents and teachers – to enhance the girls’ capacity to make positive choices in their lives. So far, it has averted the marriages of close to 40,000 girls directly and many more indirectly. “The impact goes beyond these girls” by gradually changing social perceptions, Makda says. It could also serve as a model for other regions, she says. Though girls now have almost equal access to primary school education – a major achievement of the past few years – their participation decreases higher up the education system. They are over-represented in the informal labour market and under-represented in formal jobs. They are also under-represented in politics, though women’s representation in parliament has increased to about a third in recent years. Vast disparities and problems remain. Since moving back home to Ethiopia in 2010, she has worked for the International Labour Organization, UN Economic Commission for Africa, and for Irish Aid. 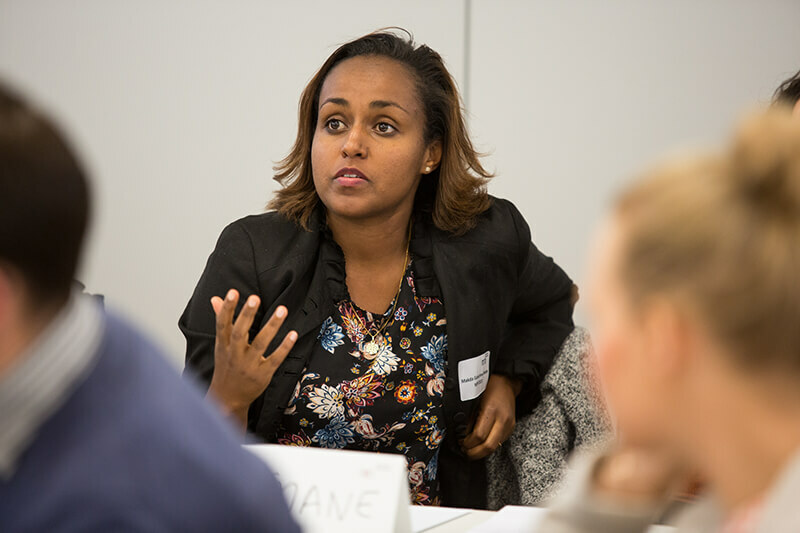 She sees her career remaining in Ethiopia, although she can imagine working or studying abroad again to gain insights into how other countries tackle the issues she is addressing.